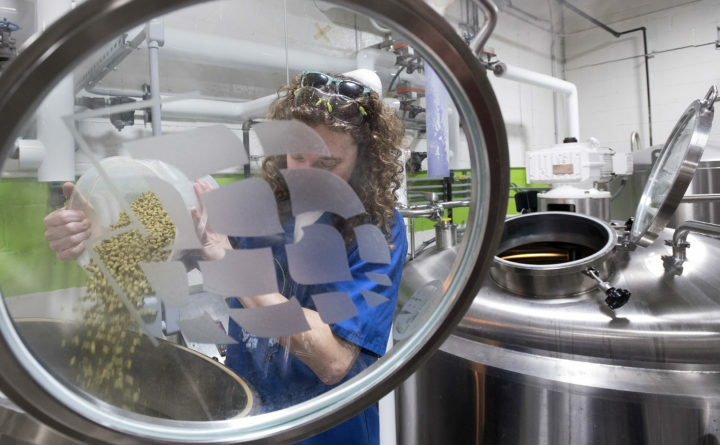 Orono Brewing Co. brewmaster Asa Marsh-Sachs dumps hops into the brew kettle while brewing a stout at the company’s new restaurant and brewing facility on Margin Street Orono, Oct. 18, 2018. Amid reports of federal workers going without pay and long lines at airport security, there’s another unexpected victim of the ongoing government shutdown: the brewing industry and, more specifically, new beers brewers might have in store. As part of the shutdown, the Alcohol and Tobacco Tax and Trade Bureau (TTB), part of the U.S. Department of the Treasury, is closed. That’s the federal bureau that approves labeling for every bottle or can of beer, cider, wine, spirit or other alcoholic beverage produced and sold in the United States. As long as it’s closed, it can’t approve any new labels for alcohol products. While this might not affect major corporations like Anheuser-Busch InBev or Diageo, a continued shutdown could make it impossible for Maine’s many craft breweries to distribute new products in 2019. Without label approval, they can’t can or bottle new brews and send them to stores. In today’s crowded and competitive craft beer scene, it’s common practice for breweries to release multiple new brews every year — be they one-off brews, seasonal offerings or new additions to a regular beer lineup. For example, in the Bangor area, Orono Brewing Co. has already released several new brews since the shutdown began on Dec. 22, including Deux Kettle Sour and Get After It Cream Ale. Mast Landing Brewing in Westbrook has released two brews since then, IPAs Norwegian Heat and Ten Seconds To Midnight, and Foundation Brewing Co. in Portland plans to release a new IPA, Dreamboat, next week. All of those beers had labels that were approved prior to the shutdown, however. If a brewery hasn’t had a new label approved, it will have to wait until the shutdown is over to get it approved. Breweries still can distribute kegs to restaurants and bars, because those aren’t subject to label approval. Chris Morley, owner of Mason’s Brewing Co. in Brewer, said that his brewery currently has two labels awaiting approval from the TTB that won’t be approved until after the shutdown is over. At Orono Brewing Co., the TTB’s closure hasn’t affected business yet, co-owner Abe Furth said, because the brewery already has labels approved for all beers it plans to release in the coming months. The shutdown would only prove a problem if it persisted for months. The shutdown also affects breweries that have not opened yet. All new breweries require a “brewer’s notice” from the TTB — essentially a license to operate from the federal government. Dave Rowland, owner of SoMe Brewing Company in York, applied at the end of November for his brewer’s notice for York Beach Brewing Company, a new sister brewery for SoMe, which will make lagers and session beers for summertime drinking and will provide auxiliary brewing capacity for SoMe. Then the shutdown happened, and a notice he thought he would have by now is sitting in limbo, awaiting approval from the TTB upon its reopening, he said. Rowland said that it’s not the first time he’s had to contend with a federal shutdown while opening a new brewery. Back when SoMe first opened in 2013, his initial brewer’s notice was delayed by more than a month due to the October 2013 shutdown.